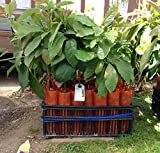 Avocado tree growing tree of the genus Persea also known as Avocado tree or Alligator pear, Avocado tree perennial evergreen plant also used as ornamental plant, can grow in tropic, mediterranean or subtropical climate and growing in hardiness zone 9+. Leaves color green and glossy in ovate shape. Flowers of Avocado tree unique they are also male and female but they do not open during the same hours, each flower begins its life as a female flower and end is life as a male. Female flower blooms for several hours while the male flowers are not in function about a day after the male bloom will open while the female parts no longer in function. There are two kind of varieties A and B. A variety is the species whose female flowers bloom in the morning and male bloom at the evening, B variety is the species that’s the male flowers bloom in the morning and female bloom at the evening. Fruit mostly oval (pear shape) the skin of the fruit is can be smooth or like alligator skin colored green to brown black the fruit inside is green. There are a variety of Avocado tree trees on different dates ripening. Possible to graft together more than one variety on the Avocado tree tree will increase the chances of bearing fruit. 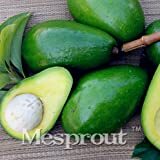 What can be done with big quantities of Avocado tree fruits?